Crushes 50 lbs. of ice per hour! 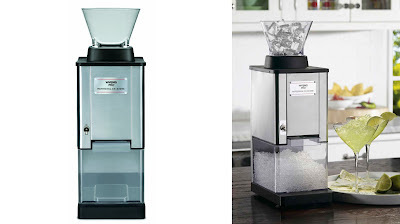 Waring Pro introduces a powerful, large capacity ice crusher that is remarkably easy to use. The Waring Pro Professional Ice Crusher features a wide mouth feed tube, operates with a single on / off toggle switch, and has a large, clear plastic container with handle that makes it easy to access up to 12 cups of crushed ice. A heavy duty motor and a commercial-based mechanism crush up to 50 lbs. of ice per hour; that's more than enough for any crowd.